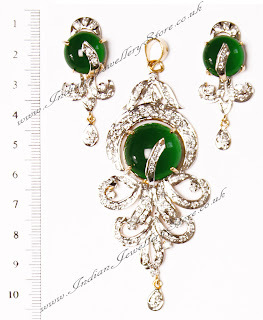 Indian jewellery in light gold & silver mix & dark forest green. Set with american dimaond stones. Set includes: pendant & earrings. Diamond pendant sets are best option for showing love and I am full surprise by seeing this wonderful pendant which completely built with diamond and emerald. I really liked it! !